We’ve become increasingly fascinated with one of David Lloyd’s hands over the past few weeks. It is the one that hangs by his side when Ian Ward interviews himself and Nasser Hussain at the end of each day’s play on Sky Sports. It is not the one that holds the microphone. It is the redundant one. The unoccupied one. 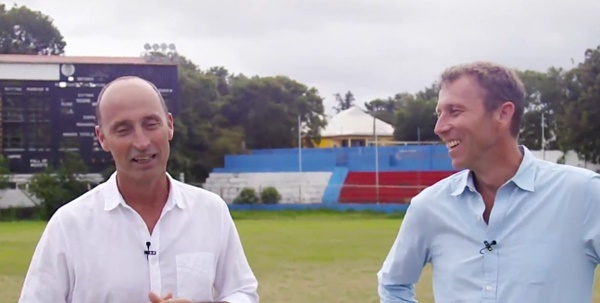 When Nasser Hussain is answering a question, David Lloyd’s unoccupied hand generally does one of two things: it either does an awkward impression of a passive hand or it gets all restless. Here is David Lloyd’s hand doing a very bad impression of a normal, relaxed hand hanging by his side. Look how rigid it is. That’s not a normal, relaxed hand. That’s a hand that’s seen a normal, relaxed hand and is consciously trying to affect the same posture. Here’s another attempt. It does this one a lot. To be clear, that’s not a hand that’s in motion. That is a static hand. Weirdly static, actually. Borderline creepily static. It is absolutely frozen in that awkward, bent-knuckled, flared-thumbed position and it stays like that for way longer than you’d think possible. Just when you think it might never move again, it does the restless thing. This typically takes the form of a thumb flick. It’s a thumb flick. You can work out what we mean by a thumb flick. It does this again and again and again. And then it freezes. 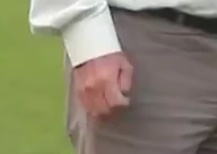 The more we’ve watched David Lloyd’s unoccupied hand, the more we’ve started to sympathise with it. First of all, consider the context. The end-of-play interview is a fundamentally awkward affair where two of the three people involved will always be doing nothing at all. They’ll just be standing there while the other person talks. This is uncomfortable enough, but then consider those moments when Nasser Hussain holds forth on some aspect of English cricket. Like his colleague Mike Atherton, Nasser Hussain’s role in the Sky commentary team is to be clear and fair and insightful. Bob Willis’s job is to have strong opinions and express them in a very black and white way and to be hugely entertaining in the process. There are few things more satisfying in life than agreeing with Bob Willis on a matter that has irked him. As he tears his target a new one, you feel (a) that the tearing of new ones is justified and (b) that the new one has been very effectively torn by someone who is extremely adept at the tearing of new ones. In contrast, Atherton and Hussain are more nuanced. They identify problems but give both sides of the story, set the issue in context and explain why what is happening is happening. Willis is watchable in an entertaining way, but Atherton and Hussain are watchable in an educational way. We suppose what we’re saying is that we trust Atherton and Hussain completely. Of the two, Hussain is the more passionate, which means that his end-of-play interviews can feel more essential, even if the nuts and bolts of what is being said is actually the same. When Nasser latches on to a particular subject that really animates him – say, England’s selection policy or the fact that county cricket isn’t preparing batsmen for Test cricket – all his colleagues can do is just step back and let him go. Nasser will talk for minutes and at the end of it you will feel smarter, better-informed and somewhat inferior. Now imagine being David Lloyd in this situation. We’d like to emphasise that we like Bumble very much. We believe that in the right environment – which is to say one where he is not being actively indulged by TV producers – he is a genuinely funny man. His off-the-cuff comments betray sharp comic timing; he can find humorous angles on on-field events; and he can most definitely deliver an anecdote. But during a Nasser Hussain diatribe, he’s basically a bystander. And worse than that, he’s a bystander who’s being asked to stand still on live TV. David Lloyd is a knowledgeable cricket man and he holds his own during the end-of-play interview, but he is not – and we really can’t emphasise this enough – he is not Nasser Hussain. Standing next to Nasser as he first identifies everything that’s wrong with the England team, then everything that’s wrong with English cricket, then everything that’s wrong with world cricket, then everything that’s wrong with the world, must be a humbling experience. Whoever you are, if you’re standing there nominally doing the same job, you’d have to feel something of a fraud. And to make that point again: they’re filming you while this happens. As you stand there thinking, ‘What am I doing here? What is my purpose within this segment?’ you’re also standing in front of a sizeable TV audience. No matter how experienced a broadcaster you are, it must be a nerve-wracking mentally-destructive experience. Now consider David Lloyd’s hands. This is speaking television and the person you’re attached to isn’t even speaking. You could barely be more redundant. The left hand at least has a microphone to hold, but the right hand is just a useless, pointless thing that has nothing to offer whatsoever. Imagine being that hand. Imagine being that hand in that situation: having no skills, no strengths, no role. You always thought you’d become smart and worthy and valuable, but at times like this it feels like all you are is the most useless part of a person who some people find moderately amusing. What the hell is up with Hasan Ali’s hand? Two uses of the phrase ‘To be clear’. Are you Theresa May? This kind of quality, in-depth analysis of the things that matter is what keeps me coming back to this site. We are all David Lloyd’s non-microphone hand in the world of discussing David Lloyd’s non-microphone hand. Being that microphone-holding left hand must also feel pretty useless. Perhaps not as much as the do-nothing right hand, but it’s all relative. But at least it gets to *look* busy. We’ve all been in those situations where everyone else knows what to do and you’re just standing there like a lemon. Holding the microphone at least protects it from this. I’ve had a similar thing with Whitney Houston albeit less so now she’s dead. She has (had) a really infuriating habit of tapping the microphone with her hand in time to the song. I remember watching her on Top of the Pops as an impressionable teenager when my father pointed it out. Watch her singing live on any YouTube clip and you’ll never unsee her transgression. I never felt the same about her subsequently. Even when she was discovered in the bath tub my first thoughts were that that was the end of her godawful tapping hand. What sort of snowflake Millennial nonsense is this? Fair enough, analyse in a light-hearted manner Bumble’s irritating digital ticks – by all means do that. But empathising with the appendage in question to the extent that you imagine yourself actually to be that appendage? This is madness. In my day, I’d have been horse-whipped for writing such self-indulgent stuff. Moreover, I’d have been thinking, “thank goodness the authorities opted for the horse-whip rather than the stocks. I really hate the stocks”. Pull yourself together, man. You’re a hand, aren’t you? Hands are good at pulling. That sounds more like Dissociative Identity Disorder than Schizophrenia, Marees, although from what I recall of my Pyschology A Level, it’s not uncontroversial. The A Level syllabus did not include the correct spelling of ‘Psychology’, clearly. I’m sure your brain said “psychology” but your hand typed “pyschology”, APW. It was a victory for physiology over psychology. In short, blame the hand. I’ve sobbed twice tonight. Once with Mrs. Smudge over the “The 12 Days of Christine” episode of inside no.9 and once alone at the perfection of KC’s insight. I am a bit of an emotional cove. That episode is extraordinarily powerful considering it’s only half an hour of television. 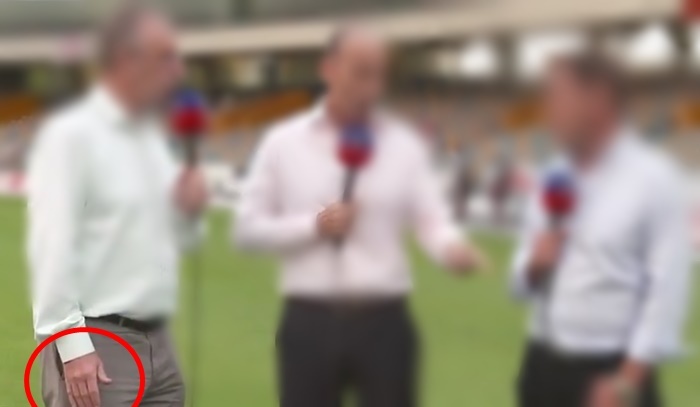 I must say I saw no evidence of Bumble’s RHS (redundant hand syndrome) last night during the post match chat. Which makes me wonder whether the evidence presented was more of a “one off” than the KC piece infers. Was that evidence extracted from the end of Day 2 chat in St Lucia? If so, is that not simply evidence that Bumble still gets twitchy merely at the thought of facing seriously fast bowling, which was the central topic of that chat. Given what happened to Bumble (and on one occasion in particular, to one of his favourite appendages) in the face of fast bowling, it is unsurprising that such talk induces PTATS (post traumatic appendage twitch syndrome) in Bumble.